Looking for the perfect way to say “I Love You” to your Dad? Cattlemens is the answer! 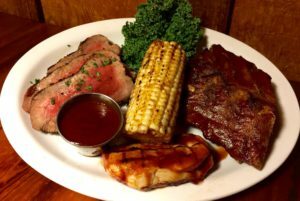 Celebrating Father’s Day June 15th-18th with the Cattlemens Combo BBQ Platter for $29.99 per person. Slow Roasted Tri-Tip, Baby Back Pork Ribs, BBQ Glazed Chicken, and Honey-Chipotle Corn on the Cob. Served with all-you-can-eat salad, hot sourdough bread and ranch-style beans. Looking for the perfect gift for Father’s Day? Give the gift of Great Steaks! Purchase a Gift Card today for the Father in your life. Check out our selection on online Gift Cards here!